Since its development, Jeep served as the original SUV. 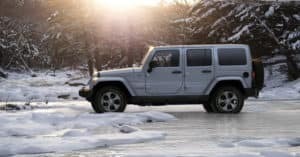 The Jeep Wrangler continues to stand out from other SUVs because of its design, performance, and a long history of being exactly what drivers are looking for. Jeep continues to make improvements to the Wrangler’s design and just released the 2018 Jeep Wrangler. Here is a look at everything that you need to know about the 2018 Jeep Wrangler JK Unlimited Sport S.
One of the best aspects of a Jeep Wrangler is that it is modular, meaning that you can take some of the parts like the doors and the roof off. It is like a convertible, but with more options. The 2018 Jeep Wrangler JK Unlimited Sport S comes with two roof options: a hardtop and a soft top. The hardtop is a good option if you drive off-road in places where falling debris could be a problem. However, both options give you the freedom to disassemble them and enjoy the open air as you drive. Both options fold flat in the trunk so that you can always have them with you when you travel. The 2018 Jeep Wrangler JK Unlimited Sport S is designed to handle off-road conditions easily, which is why most drivers choose Jeeps. New Jeeps are designed to be able to travel through bodies of water that are up to 30-inches deep for short periods of time, which is great for crossing small rivers. A 3.6L PENTASTAR V6 engine provides more than enough power for you to overcome obstacles. It is also equipped with the traction and stability features that made Jeep famous so that you can handle anything that you run into. One concern with Jeeps is that with the roof and doors removed, many drivers think that a Wrangler would be easy to steal. Jeep builds a lot of features into your Wrangler to make it extremely difficult to steal, starting with the key. The Remote Keyless Entry system makes it possible to lock your doors up to 50 feet away. On top of that, Jeep uses the Sentry Key system. Without your key being in the vehicle and used to start the car, your car basically won’t run. So, anyone trying to steal your car won’t be able to do much of anything unless they got a hold of your key first. Jeep has included many features in the 2018 Jeep Wrangler JK Unlimited Sport S that make it a great option for a lot of drivers. The best way to know if it is right for you is to test drive one yourself. Westgate Chrysler Jeep Dodge has the new 2018 Jeep Wrangler JK Unlimited Sport S on the lot with several variations available so that you can see what all of the options look like. Go take one on a test drive so that you can learn more about how the right Jeep can make your driving experience more enjoyable.